Cauliflower is only vegetable whenever I cook hubby says it is not turned out good until a while ago. 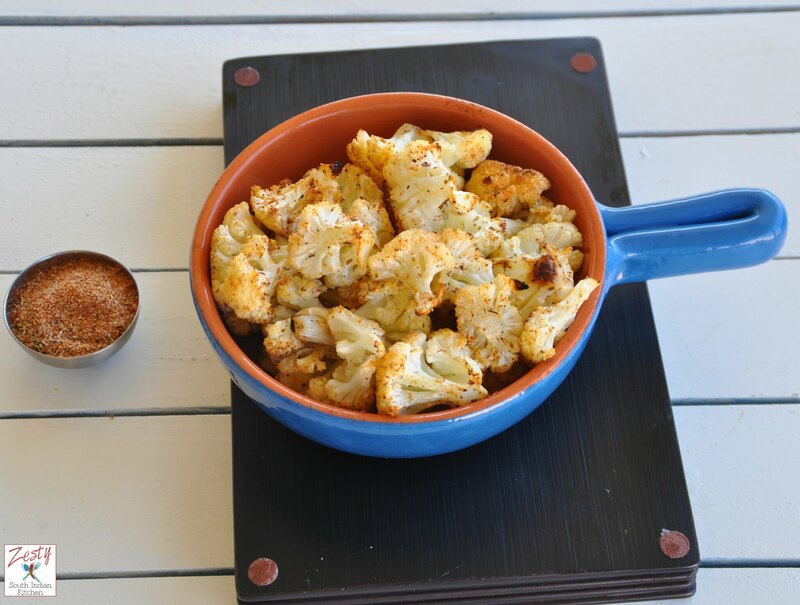 Now for a few weeks, he has changed his opinion yes found out two delicious recipes to make cauliflower, one is tomato cauliflower masala and second this Cajun spiced roasted cauliflower. 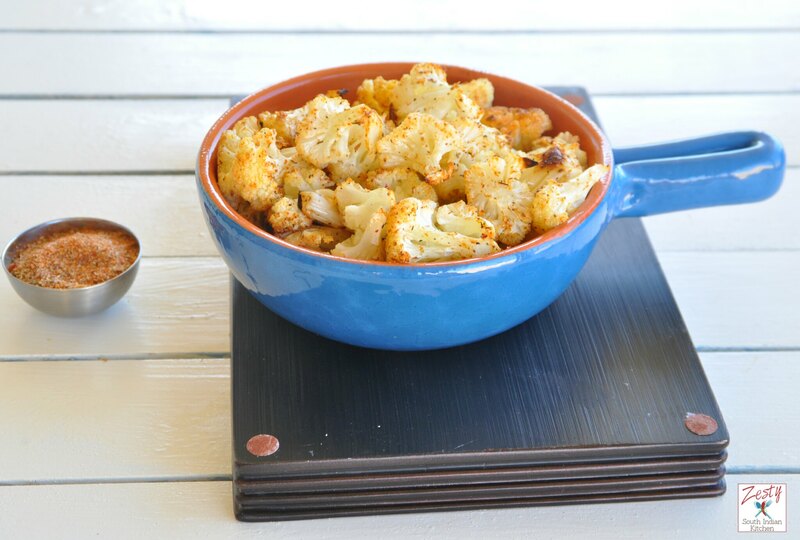 This Cajun spiced roasted cauliflower is from my friend Alea Milham’s new cook book. Prep-Ahead Meals from Scratch is book by Alea Milham. She write the blog Premeditated Leftovers. We, I, Alea and April were part of Hearth and Soul blog hop, I know her through that blog hop. However she got busy with cook book and blog, and left blog hop. Even then if you need something she will immediately return answer to your queries. My review doesn’t influence any way of our friendship. Book Prep-Ahead Meals from Scratch has 6 chapters. In the 4 pages of introduction, Alea explains about batch cooking, speed prep techniques, food storage tips, menu plans and money saving shopping strategies. Each chapter has its own introduction about how to cook on various ways on batch scale, like stove top, oven, pressure cooker etc. First chapter is about chicken recipes, and Asian chicken pasta salad, Chicken marsala pizza on yeast free crust, Chicken alfrerdo stuffed shells with broccoli are a few recipes. Second chapter is all about Pork, you can find chipotle pulled pork tacos, Skillet Mac and cheese with Ham and Broccoli, White chili with rice, Crustless ham and asparagus quiche sounds interesting. Then 3rd chapter is about Beef, Southwestern sloppy Joes, Sunday night roast beef, Fajita frittata, Asian Beef and Broccoli slaw warps and Skillet beef Burgundy are few recipes. Chapter 4 is about Beans and rice. I have few recipes in the list to try and those are Three Bean Minestrone soup, Tuscan white bean and acorn squash soup. Mediterranean beans and rice, South West three bean salad, 15 minutes Refried Black beans, 15 minutes baked beans etc. The chapter Five is about veggies which can be ready in a few minutes. Cinnamon glazed carrots, Cajun spiced cauliflower, Garlic ginger green beans, Pumpkin pie spiced Parsnip fries, seasoned potato wedges, and Broiled chipotle sweet potatoes etc are few on the list. Chapter 6 is about seasoning mixes, sauces, and broth etc. I tried Cajun spiced cauliflower recipe from the book, due to the spicy nature of my palate I increased the spices to from 1-2 ½ tablespoon .Also used only half head of cauliflower as that was left after making curry. It is delicious and excellent side dishes. Hubby too agreed with me. If you have less tolerance to spices then reduce the spices. I made about 1/3 cup of spice mix and it was enough to use it for this recipe and also for another recipe of fried dill chips. I like the book as it helps you to make batch cooking and all are simple and easy recipes you can put together in less time. One thing I found that not all the recipes have final pictures, if it were there it will be good that will a help for the readers. Also there is desserts are lacking in recipes. If you are person goes with menu first then buy this book as it helps you make meals ahead. Here comes the recipe. Disclosure: I received a copy of this book from Alea Milham for this Review. However all opinions are mine. 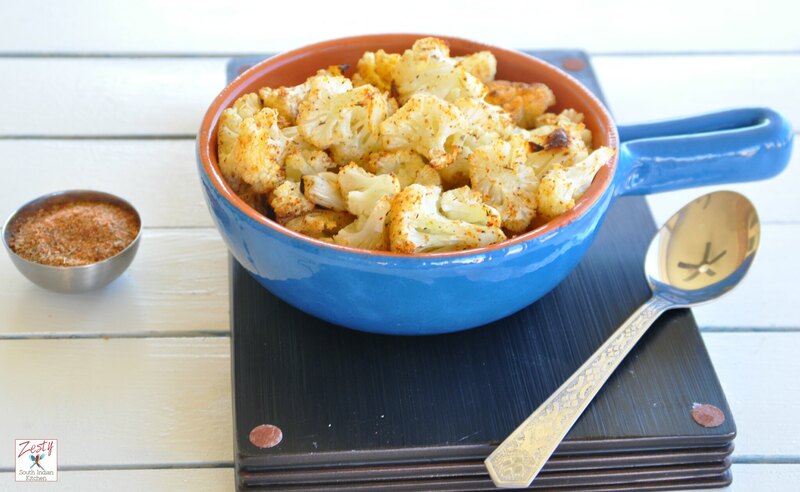 Delicious spicy roasted cauliflower and excellent side dish. First make Cajun Seasoning mix by combining all the ingredients in the list and mix well and set aside in airtight container. Line cauliflower florets in single layer and drizzle olive oil and toss them really well. Then sprinkle the Cajun seasoning mix and mix well so that spices get coated really well into each pieces. Bake for 20 minutes, or until cauliflower is fork tender. 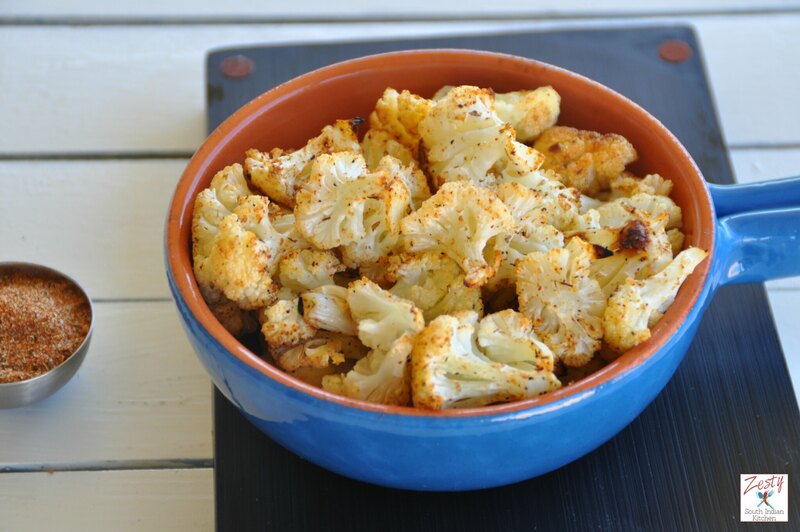 Just wonderful and spicy roated cauliflower ….love them ….nice to know about .. Prep-Ahead Meals from Scratch is book by Alea Milham……. It is so nice to see cauliflower prepared in this way .. Makes it very appealing to the eyes and taste buds.. Lovely ..
Love cauliflower. I usually roast them with spices turmeric, curry powder, etc.